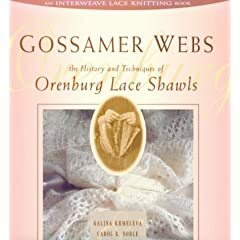 The other day, in search of Something Different, I plucked Galina Khmeleva's lovely book--Gossamer Webs--off my bookshelf and refreshed my memory of Orenburg shawls. These extremely fine shawls have been traditionally knit by ladies in and around Orenburg, Russia. The designs are quite geometric and the construction unique and efficient. The traditional yarn--goat down plied with thin single-ply silk--is handspun on lightweight supported spindles. Unlike Shetland shawl knitting, which is popular enough to support commercially available yarn and a wealth of patterns, genuine Orenburg yarn cannot be purchased and charted designs are basically limited to those in Galina's books. In fact, Ravelry's knitqueen05 has knitted most of Galina's patterns--over and over and over. Yike! The thought made my brain cramp--I was shearing sheep and spinning before most of you were even born. My flock of rare non-white sheep and the byproducts thereof put me through graduate school. I can't say that I enjoyed spinning. I recall with a grimace the lady who brought me Samoyed dog combings every year so I could spin sweater yarn for her. No matter how carefully or with what I washed the yarn, it retained its appalling dog odor and had to be dried as far from my house as possible. Worse, my cats hated the stuff and I had to leave it hanging in the barn lest it get clawed back into fluff again. However, I did win several blue ribbons at the state fair for my fine skeins of lace yarns (90 wpi! ), so the thought of spinning yarn for an Orenburg doesn't make me faint. Times have changed since the 60's, when only a few types of wheels were available for purchase. As I wandered around the Internet spinning sites, I chanced upon the perfect solution for whipping out fine yarns without straining the shoulder or knee. Warning!! All you spinners out there are about to toss rotten tomatoes at your screen. Spinning snobs should exit now!!! Fetchingly made from PVC pipe, a wheelchair wheel, and a knitting needle, Babe's Electric Liten Spindle Charkha Wheel entranced me. It weighs only two pounds and disassembles into a small box of giblets for compact storage. It's made for spinning gossamer-weight yarns and the motor assures a nice even pace for drafting. I haven't quite justified the cost to myself yet. I may decide that the entire concept is too much trouble and just use some gossamer-weight cashmere to knit an Orenburg. On the other hand, new horizons beckon. I wouldn't want to get bored, now would I? Harry, of course, thinks the concept is wonderful. At last he will have someone who can repair his disgraceful web. "Male spiders may knit, but they don't waste their time producing spider silk," he sniffed. "And cashmere batt will make an excellent mattress." A well-written pattern is akin to a gripping novel--tightly plotted and suspenseful, and a satisfying denouement with all the loose ends tidily wrapped up. A poorly written pattern, on the other hand, reminds me of a badly produced movie--terrible acting, disjointed, confusing plot, and loose ends galore at the end. Occasionally, I will run across a pattern that makes me snicker. For example, any production with the line "Reserve at least 10 hours for sewing together" is, by definition, a genuine howler. When I encountered this particular direction in the Queen Ring shawl, I giggled for at least ten minutes. The original shawl is knitted from the borders inward. I don't like that construction for a number of reasons, not the least of which is the epic sewing-bits-together at the end. I wouldn't mind the sewing so much if it produced an attractive finished product. It doesn't. Sewn-together seams look ugly and I won't use them. The second problem with the original pattern is that only half of the border is neatly mitered around the center's corners. The other two sides are stretched into shape during blocking. The stretching might work if the shawl is knitted with a nice, compliant wool yarn. It probably won't work with something like cashmere/silk yarn, which has the elasticity of a watermelon. The fact that the corners in the lovely photo are scrunched together and not viewable makes me uneasy. I want fully mitered corners that won't produce an unpleasant surprise after hundreds of hours of intense knitting. Thus, I regraphed the shawl to be knit from the center outward, which means the border is picked up around the center square and knitted around and around (and around and around and etc. etc., and so forth....). This process has its own inherent problems. First, the border itself must be inverted, because it's being knitted from top to bottom instead of bottom to top. Anyone who has ever reversed a pattern knows that it's usually impossible to simply turn it upside-down. And then there is the tedium of having to purl every other round in pattern to maintain the garter stitch in circular knitting mode. I tried a number of different fake corners to avoid the purling, but didn't care for the results. Unfortunately, at some point during this epic graphing production, I took a well-deserved break. When I returned to the computer, Harry had redesigned the shawl border to suit his bizarre awful regrettable erm, unique taste. He had lopped off the seed pods (a decision I applauded) and substituted the never-before-revealed Shetland motif: Flying Bats. Harry announced that he just adores bats. I was a bit puzzled when he uttered that statement, because airborne insect-devouring predators just didn't strike me as arachnid-friendly. However, Harry pointed out that bats make exceptional targets and he enjoys plinking at them with his custom-built Barrett Model 82A1 .50 caliber sniper rifle (with BORS optics). I also took issue with his introduction of non-traditional motifs into a mostly traditional Shetland shawl. I have this uneasy feeling that, after having worked his bats into the shawl border, I will open the door and find a mob of enraged Shetland Islanders bearing torches and brandishing pitchforks. But Harry pointed out that our designs often begin with a healthy respect for tradition and end up, well, different than the original pattern. So, here's a bit of eye candy for you. It's one repeat of the center. The shawl is being worked in a 52/2 yarn composed of 60% wool, 20% cashmere, 20% silk that I purchased at Avril and dyed myself. Alas, there is no more of it, which is a real loss to the lace-knitting community. It's a lovely knit. My mother, who could out-curse any five drunken sailors, was (incredibly) an English major at NYU. I was therefore subjected to considerable cruel and unusual punishment during my formative years. From age 7, I was tasked with solving the New York Times crossword puzzle every morning before I left for school. Worse, when I achieved the lofty status of a tenth-grader, I was required to work it out using a pen. I finally rebelled when she dragged out the typewriter sometime during my senior year. I think she was desperately trying to train me up so I could beat the socks off my Uncle Stanley, who could actually work the London Times crossword with a typewriter, a feat even my mother couldn't match. The result of all this brain-twisting was that a) I knew more obscure words than my teachers and b) I was a whiz at spelling. At least I was a whiz at spelling before I encountered this shawl. An Ann Hanson Faroese-style design, the final product is indeed lovely and doesn't slide off the shoulders, thanks to the top shaping. The knitting, alas, got a bit tedious. I designate patterns of this type as "Beer-Bottle Shawls." Wait--it's not what you're thinking! I am referring, of course, to the repeat accumulation. One repeat on the needles, two repeats on the needles, three repeats on the needles....100 bottles of beer on the wall etc. blah. By the time I have worked five repeats, I start looking for tax forms to fill out in lieu of knitting another row of The Same Thing Over And Over. After 10 repeats, I avert my eyes when I walk by the WIP's little plastic bag. But, after a few weeks of avoidance behavior, I generally sit down, plug into some music, and finish it off. It was a simple knit and I adored the feathery edging. The real joy of the shawl was the yarn: 2/16 Lamoramere Fine Lace Blend (50% Cormo Lambwool, 40% Angora, 10% Cashmere), from Running Wild Farms. It's soft, lofty, springy, has a very fine halo, and dyes beautifully. I bought a skein of white and hand-painted it in dark blues and purples. I did modify the edging pattern by knitting all the stitches in both directions. Life is too short to do all the purling acrobatics required as written.